Played in one tournament, the ITA All-American Championships…went 1-1 in singles with both matches against ranked opponents…defeated 30th ranked August Holmgren of San Diego in a come from behind three set victory…earned 18 pro singles wins in the fall through qualifying and main draws of various Futures…qualified for six singles main draws, advancing in four of them. Was a part of the Seminole Tribal Council leadership group during the season… had one of the best seasons in school history with a 24-1 singles record and a career-high singles ranking of No. 24, finished the season ranked 39…in doubles Poullain went 11-12 and achieved another career high as he was ranked as high as No. 8…his total season singles record (30-5) places him tied for seventh in school history in single-season singles wins and eighth in singles season singles winning percentage (.857)… Poullain was named to the All-ACC second team for his stellar performance this season and won ACC Player of the Week Honors twice… he was selected to NCAA Singles Championship and was eliminated in the second round… Poullain won 10 of his 24 dual matches against ranked teams and went 2-0 against ranked singles opponents… In the first weekend of the season went 3-0 in both singles in doubles…clinched the match against the Hawai’i on January 6…defeated Connor Curry of Texas Tech on court two in straight sets, 6-3, 6-1 and with partner Jose Gracia, defeated Texas Tech’s No. 1 doubles and No. 29 ranked doubles team of Jackson Cobb and Alex Sendegeya 7-5 to clinch the doubles point against No. 24 Texas Tech in a 6-1 victory (Jan. 8)…helped lead the Seminoles to a Florida State Spring Invitational championship with a 2-0 singles record…shut out Jamie Fraser of Louisiana 6-0, 6-0 and beat Jack MacFarlane of Georgia State in straight sets 6-1, 6-1…gave the Seminoles a 3-1 lead in the match against East Tennessee State with a 6-3, 6-4 win on court two…earned one of three singles wins in Florida State’s first match-up of the ITA Kickoff Weekend against Purdue (Jan. 27) with a 6-1, 6-2 win on court three… started a 17 match win streak when he clinched the match against No. 8 Florida (Feb. 3) during the College MatchDay event hosted at the USTA National Center in Lake Nona, Fla. live on the tennis channel…defeated Florida’s Oliver Crawford 7-6 (4), 7-6 (5)…won both his doubles (court 1) and singles (court 2) match against Liberty (Feb. 24)…was the first to finish against No. 50 Clemson (March 5)on court three, winning 6-3, 6-1…helped defeat in-state rival Miami with a 6-3, 6-2 win on court three, also won his doubles match 6-2 on court two (Mar. 9)…defeated Pepperdine’s Lautaro Pane 6-3, 6-4 on court two (Mar. 12)…gave Florida State a 3-1 lead against Drake (Mar. 16) after winning 6-3, 7-6 on court three…finished off the match give the Seminoles a 5-2 win against Georgia Tech (Mar. 18) with a three-set win on court three…was the first to finish against No. 23 NC State in a 4-0 win (Mar. 23)…took down No. 30 Skander Mandouri of No. 1 Wake Forest on court three 6-4, 5-7, 6-3 to tie the match at three as the Seminoles took down the No. 1 team in the nation (Mar. 25)…earned his 17th win of the season with a three set win over Nicolas Rouanet of No. 28 Louisville (Mar. 29)…earned first doubles win of the season with partner Terrell Whitehurst to clinch the doubles point against Louisville…went 2-0 on the Noles trip to Virginia, taking down Virginia Tech’s No. 3 player 6-4, 6-2 (Apr. 6) -and Virginia No. 3 player 7-5, 7-5 (Apr. 8)…defeated Boston College (Apr. 13) on court two to improve to 7-0 on that court this season…helped defeat No. 28 Notre Dame 4-3 with a straight-set win on court three (Apr. 15)…shutout Duke’s No. 104 Catalin Mateas, 6-0, 6-0, on court three in the ACC Tournament quarterfinals (Apr. 27)…defeated 49th ranked Oliver Crawford for the second time this season with a 6-1, 6-1 win in the NCAA Singles Championship. Finished off his fall season with a 5-3 singles record and a 4-2 doubles record with partner Jose Gracia…went 3-1 in singles against nationally ranked opponents including a 6-2, 4-6, 7-6 win over No. 48 Robert Kelly of North Carolina, a 6-3, 6-7, 6-4 win over No. 80 Dan Little of Utah and a 6-3, 6-4 win over No. 11 Brandon Holt of USC…made it to the round of 16 at the ITA All-American tournament where he earned two of his ranked singles wins…after losing in the first round of doubles at ITA All-Americans, Poullain and Gracia came back and won three straight matches including wins over No. 20 Spencer Papa and Jake van Emburgh of Oklahoma and No. 29 Christopher Kougouch and Parker Wynn of Louisville to win the All-American consolation bracket and qualify for the ITA Fall Championships…went 1-1 at the ITA Southeast regional at Georgia Tech…went 2-1 and made it to the round of 16 at the ITA Fall Championships in Indian Wells where he beat No. 11 Brandon Holt…made it to the round of 16 in doubles as well with a 7-5, 6-1 win over Benjamin Hannestad and Tim Ruehl of Arizona State. Emerged as a consistent force in the middle of the lineup, leading the team in singles victories (21), doubles victories (18), and overall wins (39) at the number three court…named to All-ACC third team following the season…also named to the All-ACC Academic team while pursuing master’s degree in International Affairs…team captain…reached first career ITA singles ranking of No. 94 in the final week of the regular season…with Jose Gracia, finished the season ranked No. 49 in doubles play…won nine of 11 singles matches to open the season while posting 21-6 overall record…at No. 1 Wake Forest, defeated No. 14 Skander Mansouri 6-3, 6-2 for first career ITA-ranked singles victory…won nine of 11 matches to conclude the year, including a 6-4, 6-4 defeat of TCU’s No. 83 Guillermo Nunez in the second round of the NCAA Championship…posted 16-9 record in doubles with Gracia and an 18-10 record overall…steady force at the No. 2 doubles court helped lead the Seminoles to 21 doubles points on the year…defeated No. 15 Luca Corinteli/Carl Soderlund of No. 2 Virginia, the second-highest doubles victory of the season for the Noles Championships while dealing with injury throughout the fall. Joined the team in September as a graduate transfer from Nantes, France…showed well with a 2-1 singles record in the ITA Southeast Regional. 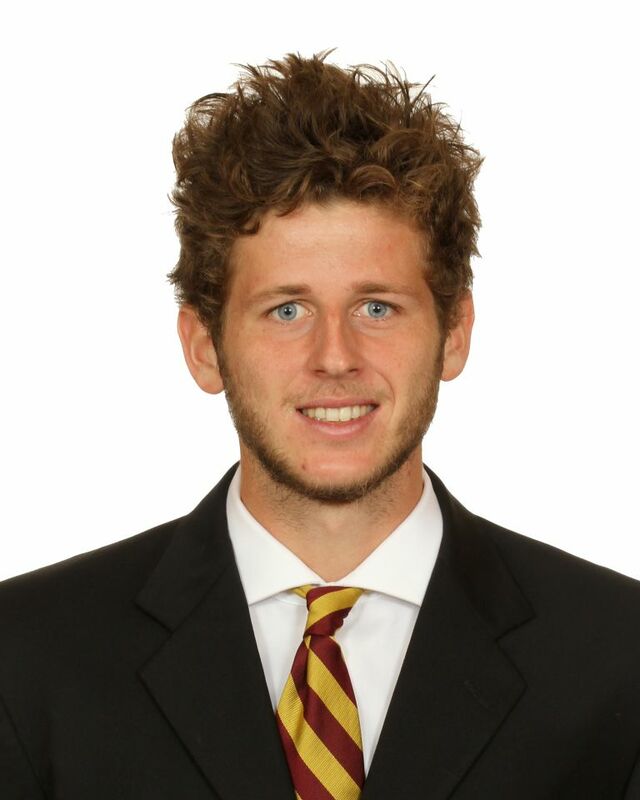 Graduate of the University of Nantes in France will have two years of eligibility at Florida State…top-ranked recruit from France in the 2016 class…achieved a career-best ATP ranking of 1298 in singles, 911 in doubles, won singles in French National University Championship in 2015…bronze medalist at World University Games 2015 in South Korea. Avid soccer fan whose favorite team is FC Barcelona…pursuing a graduate degree in Sport Management…aspires to play professionally on the ATP tour…son of Michel and Carolina Poullain…born December 5, 1995.